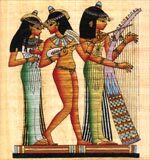 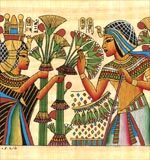 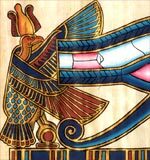 Papyrus Painting of King Tut and Ankhsenamun Love Vows Scene at their ceremonial wedding party; a perfect gift for lovers in Valentine's Day or any special occasion. 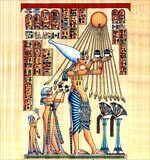 Akenaten and his Family, Nefertiti praying to the sun-god Aton who provided his rays to the king and the queen. 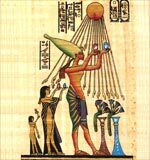 The sun rays end up with hands holding the key of life offering it to the royal family. 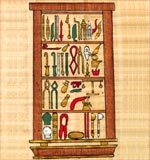 Egyptian surgical tools used in ancient Egypt in the embalming process. 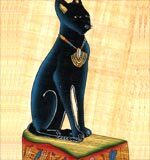 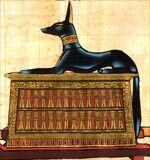 Anubis, the Guardian of the Dead, is the Greek name given to the jackal-faced God of the Dead, feared and respected in Egyptian mythology.